Mystery still surrounds the lone Burdines employee who emerged last week from an isolated part of the now Macy’s Home section in Dadeland Mall. Maria Delgado, a former Dishware Specialist who surrendered herself at the Home counter after a suspected 13 years spent in hiding. Eyewitnesses say that during the after-work rush on December 19th, Ms.Delgado suddenly lunged from behind a display of mixers only long enough to grab a lingering customer and drag her into a supply closet. Her appearance was described as disheveled, she was wearing what appeared to be an old Burdines uniform, although it was both wet and torn in several places.Investigators from the MDPD say that Maria is potentially the final holdout in the violent dispute between Macy’s and Burdines. Until now Emilia Perez, who finally surrendered on White Thanksgiving hours before the 2004 Black Friday, was believed to be the last holdout. 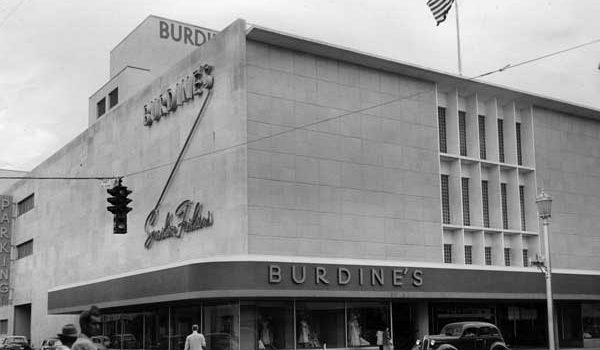 The famed Burdines holdouts as we know waged savage, sometimes inhumane, shadowy guerilla war, hiding among the less trafficked sections of the flagship Macy’s in Dadeland Mall, often employing false flag operations and highly orchestrated Oceans 11 type hijinks to thwart Macy’s 2004 buyout. Many efforts were made to smoke the Burdines employees out and after a particularly effective amnesty program in October 2004, it was believed that the last of the Burdines warriors had succumbed to the Macy’s juggernaut. Macy’s hoped for a cleaner resolution this time, sending in a team of corporate attorneys as well as local police. After 14 failed attempts to communicate with Delgado, usually ending in bloodshed, Macy’s went for a change of pace. Macy’s reached out to Delgado’s manager Ramiro Costa to put an end to the matter. Dressing in his old Burdines uniform Ramiro entered the Macy’s home store and approached Delgado’s make-shift breakfast room. Delgado recognized Costa and immediately exited her stronghold and embraced him. After hours of discussion and explanations, Costa ultimately ordered Delgado to clock out. Ending this decade-long struggle.